Longmore Lecture 2017 Recap: "Access Intimacy, Interdependence, and Disability Justice"
At this year’s annual Longmore Lecture in Disability Studies on Tuesday, April 11th, we welcomed community organizer, educator and national justice leader Mia Mingus who explored the idea of "Access Intimacy." Hosted annually by the Paul Longmore Institute on Disability, the Longmore Lecture aims to feature a speaker who continues Paul Longmore’s legacy of scholar-activism. Institute Director Catherine Kudlick and Associate Director Emily Beitiks selected Mingus after watching one of her talks on YouTube with the Institute's interns, who appreciated how Mingus helped them connect their interests in disability to social justice issues more broadly. Mingus defined the concept of "Access Intimacy" as "... that elusive, hard to describe feeling when someone else 'gets' your access needs. The kind of eerie comfort that your disabled self feels with someone on a purely access level. Sometimes it can happen with complete strangers, disabled or not, or sometimes it can be built over years. It could also be the way your body relaxes and opens up with someone when all your access needs are being met." Mingus currently resides in Northern California and identifies as a queer, physically disabled, Korean woman, transracial and transnational adoptee, who was born in Korea, raised in the Caribbean, and nurtured in the U.S. South. We are grateful to all our attendees who packed the room and engaged in a productive Q&A conversation following the lecture. 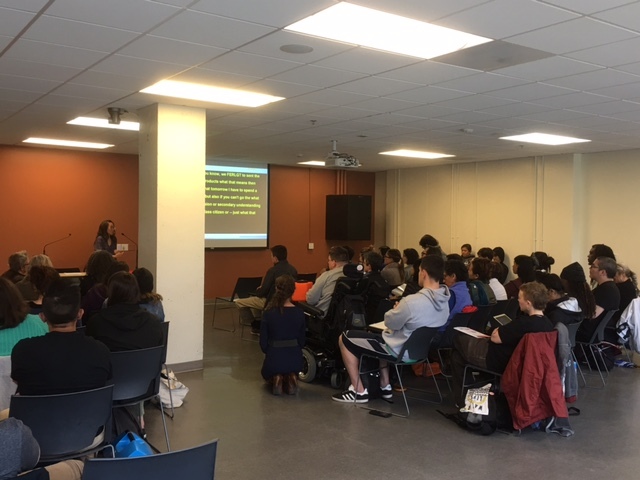 Director Kudlick concluded the lecture with exciting news: next year's Longmore Lecturer will feature Disability Visibility Project's Alice Wong! Missed the Longmore Lecture? A full video with captioning is coming soon! You can also read a transcript of her talk here.